A 10-year-old girl in Canada has become the youngest person to discover a supernova - an exploding star which can briefly outshine a whole galaxy. Kathryn Gray was studying images taken at an amateur observatory which had been sent to her father. She spotted the magnitude 17 supernova on Sunday. Supernovas - which are rare events - are stellar explosions that mark the violent deaths of stars several times bigger than the Sun. The supernova was discovered in the galaxy UGC 3378, about 240 million light years away, in the constellation of Camelopardalis. "I'm really excited. It feels really good," Ms Gray told Canada's Star newspaper. Kathryn's father, Paul Gray, himself an amateur astronomer, helped her make the discovery by taking the steps to rule out asteroids and checking the list of current known supernovas. The discovery was then verified by independent astronomers and officially registered, the Royal Astronomical Society of Canada (RASC) said in a statement. Looking for supernovas requires going through old images of star fields and comparing them to new pictures. "Kathryn pointed to the screen and said: 'Is this one?' I said yup, that looks pretty good," Mr Gray told the newspaper. 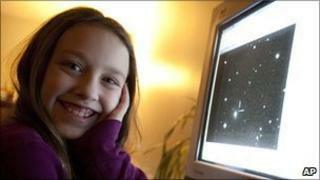 "It's fantastic that someone so young would be passionate about astronomy. What an incredible discovery. We're all very excited," said Deborah Thompson of RASC. Supernovas are of interest to astronomers because they manufacture most of the chemical elements that went into making the Earth and other planets, says the RASC. Distant supernovas can be used to estimate the size and age of our universe.